It’s just like a regular wash, just in reverse order. You apply your conditioner first, then your shampoo. This method works for pretty much any hair type that suffers from a lack of volume, dryness, frizz, or damaged hair. But it’s the fine, limp, oily hair girls that will see the most beauty benefits from the change. Also, those who have clogged hair follicles or prone to product build up doing these two steps in reverse may help you to achieve better results. But whatever your hair type, I encourage you to give it a try at least once to see if it works for you or not. Normally, you shampoo first then condition. But this can actually be bad for your hair, not everyone’s hair, but most of us are not benefiting doing this. When you shampoo first you remove dirt and grease from your hair, however in the process you are also stripping away hair’s natural oils – that protect the hair and add shine and softness to it. To avoid dryness you then apply conditioner, which coats your hair with ‘fake oils’. You could be using a natural conditioner but it’s still not same as your hair’s natural oils. What happens if you reverse the order? If you apply conditioner first, it creates a protective film over the hair. Then when you shampoo, the harsh cleansers in the shampoo can’t penetrate as deep, so less of the natural oils are stripped away. It’s a more gentle, nourishing cleanse. With this method, you will see less hair damage, less split ends and softer and bouncier strands. When you condition your hair, you never quite manage to get it all out – leaving a residue that weighs hair down and makes it flat and dull looking. Reversing the order in which you wash your hair means your hair still gets all the glossing benefits of conditioner and the cleansing properties of shampoo, but without any icky residue. The leftover residue can clog the hair follicles, damaging them in the process. Over time this can affect hair growth and even cause hair loss and thinning. With shampoo washing out all extra conditioning oils – which can attract dirt and grease – your hair and scalp will feel clean and much lighter for many more days. And it will be easier to style- even without creams and gels. Having used the reverse hair washing method myself, I can vouch for its effectiveness. Only thing is I use cold pressed oils for conditioning, instead of store-bought conditioners. 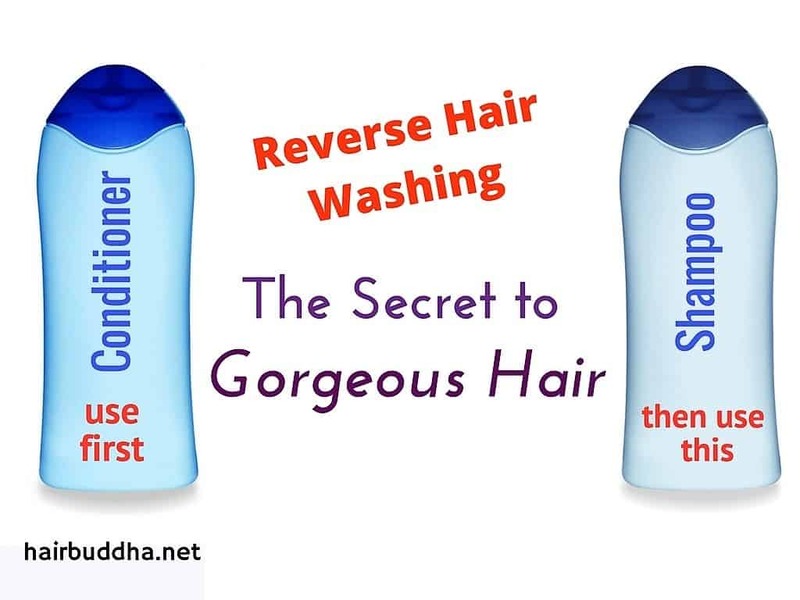 But most ladies who have tried reverse hair washing, with regular conditioner, are extremely pleased with the results. The ones with fine, oily hair state that their hair looks and feels thicker, fuller and has lots of shine. Plus, it doesn’t go oily too quickly. And ladies with thick, coarse hair report that reverse washing leaves their hair soft, smooth, shiny, with great body and shape. Also, the hair is easier to comb and frizz-free. The first step in this reverse shampooing is to apply conditioner on wet hair. Leave it on for 3 to 5 minutes, or regular amount of time that you would normally use. In the meantime, you can do rest of the things that you do in the shower. Before you use the shampoo, rinse your hair very lightly just to get it a little more wet. Then, apply shampoo – with the conditioner still sitting on your hair. You may need a little less shampoo than you use. Lather and rinse thoroughly…that’s it! So nothing changes in terms of the amount of time you spend in the shower. Just the order is reversed. Tip: Use a conditioner that is made from natural ingredients, as it will be free of synthetic chemicals and therefore will nourish and moisturise your hair better. And also better for the environment. Do the last rinse with colder water; this seals the hair cuticle and adds a nice shine to the hair. Let your hair air dry – it gives a beautiful natural look. You are most likely to convert to air drying forever. You can apply conditioner close to the scalp but avoid directly into the hair roots. If you rinse the conditioner out, then shampoo, you may not benefit as much, especially if you have thick, coarse hair. This is because the conditioner acts kind of like a shield, creating a barrier between your hair and your shampoo. So that your hair gets clean without being stripped of its natural oils. But if your hair is fine, oily and gets greasy fast, try rinsing the conditioner out before shampooing. Your hair may like it better. If your hair is dry, thick and coarse, do a condition-shampoo-condition regimen. Coarse hair tends to lose moisture very quickly, so using a small amount of leave-in conditioner after shampoo will seal in moisture, reduce frizz and impart a healthy shine. Natural oils like argan, almond, and babassu work great as a leave-in conditioner. Is this really a recent trend? If you have done or heard of coconut oil hair mask – it is nothing but pre-wash conditioning (and it’s natural and full of goodness for the hair). Have you ever used conditioner before shampoo? How was your experience? Previous Post 15 Home Remedies for Grey Hair Next Post Q&A Which is a good homemade shampoo for Oily hair? If I apply a hair mask (the banana hairmask) and then I do the reverse Hair washing,does it still work? Do I just rinse the mask from my hair ,then apply the conditioner and shampoo? Never tried it this way, but I think it will work. I’ve been doing this for a while now and love the results. I have waist length, somewhat coarse half grey, half brown hair and it tends to be pretty frizzy without a lot of conditioning but conditioners really bother my scalp. I switched from regular conditioners at least a year ago to the Renpure washing conditioners and LOVE what it does for my hair- but my scalp is still not happy. I’m actually trying the fenugreek, yogurt and oil recipe on my scalp today once it’s ready! I’m excited to see if it helps with the itchiness. I used Jason dandruff shampoo for quite a while but it didn’t fix anything even though it really did help with the symptoms. Plus, it turned my hair more and more yellow and really messed up some silver jewelry I was wearing at the time- sulpher is useful but it’s very hard on silver! I’m using Aubrey Organics rose maquetta shampoo right now and that’s been really good for hair and scalp both. Looking forward to trying the scalp mask, though, for sure! I also use Argan oil or coconut oil on my hair as a pre-washing/conditioning conditioner and those are both amazing for my hair! It makes it very sleek and soft and seems to intensify the color I do have left and brighten the silver, too. Honestly I was skeptical at first but gave it a try anyways this morning. I have thick, curly hair, but this really calmed down the frizz. I am really amazed at the results. Thanks for the tip :-). Hi Minaz. I have a small question. How do you proceed if you have oiled your hair? Do you rinse off the oil, apply conditioner and then shampoo? Hi Sharm, oil is form of conditioner, so there is not need to condition again. But you can try what you said: rinse off the oil, apply conditioner then shampoo. Let us know which one has a better effect on your hair.